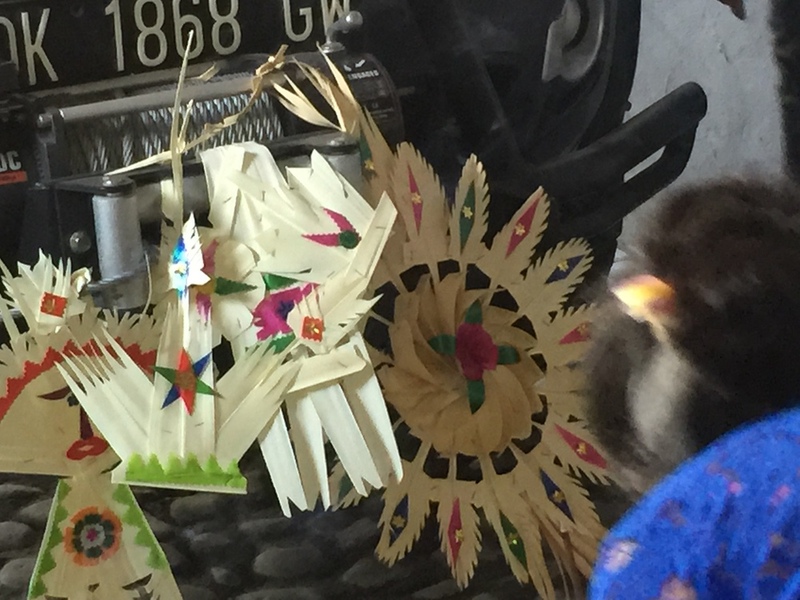 Galungan is for the Balinese like Christmas for the West. A time of celebration and meeting with friends and relatives, traveling everywhere. The preparations for the festivities takes place 2 days before, with the man preparing the sate, chicken and tuna. Well mixed version with coconut flakes and cream stuck on a wooden small spear to be seared over and open charcoal. Every family produced masses of these. The next step is to find the right bamboo branch, very long and flexible on the top. It involves very intricate decoration work. Ours, at Jiwa Damai, is about 9 meters high and the tip is supposed to be flowing in the wind. But we are in Bali and each year we also celebrate the Galungan - Kuningan. Therefore, our interns, volunteers and staff have prepared also a Balinese Penjor. Here are some pictures.